Shoeboxes ... or craft storage? Looking at cheap craft storage ideas is a good idea for the crafter that is on a budget or that just has a whole lot of crafting stuff. A good way to save some money is to go with storage containers that are not specifically labeled as craft storage containers. Containers made for a specialized use often come at a premium cost. Then again, you don't want to use just any old container. You want one that will keep your supplies neat and organized. Here are some good ones that can serve several purposes. It's not recommended to store sharp instruments in here, since they could poke through the cardboard. These bins come in lots of sizes, they're easy to stack and they keep your craft supplies dry. It's a good idea to look for these bins at discount retailers around the beginning of the year. They often go on sale to try to catch people packing all their ornaments and wrapping paper up in the attic or garage. These are almost the ideal storage container for small crafting supplies that tend to get lost among the others. The many compartments in a tackle box make it ideal for holding seed beads, pins, sequins, needles, necklace clasps and other small fasteners and glue dots. You can find them at most outdoor supply stores. If you can't find a tackle box to your liking, also look at cosmetic storage boxes and children's lunch pails. A favorite among college students, these drawers only cost a few dollars. You buy them flat and then unfold them as needed. Often you can find them in sets of two or sets of four. Like shoeboxes, these containers are not good for storing sharp objects. 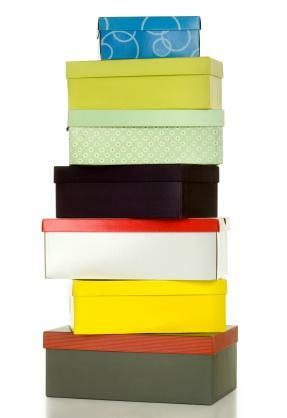 However, unlike shoeboxes, they are easily accessible even when they are stacked up. You can also check out your local dollar store. An item in its aisles may just spark your own creative storage idea.